Magical painting! You've really captured the transparency of the bag and the weight and roundness of the fruit (I presume) that's in it. Very impresssive Don, love the glimmer of light at the bottom of the bag. Thanks for the visit, Marie, and your nice words. I enjoy your blog. Triecia, good to hear from you. Hope you're well. Thanks for your thoughts. Thanks, Bill. That's a trip to find you studied with Paaschke. He's the first one I thought of when you said you were going to Chicago. Looking forward to seeing what emerges from your quirky, immensely creative brush! Martha, thanks so much for the encouraging words! Wow. This really is magical. I love the cool light you've captured and the warm shadows. 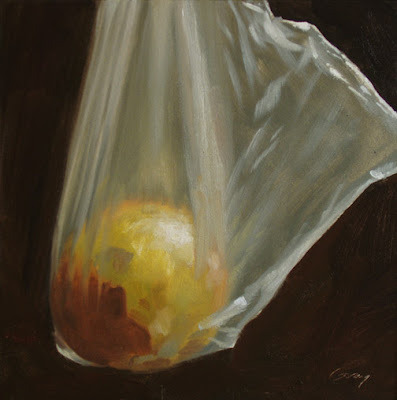 I love how the bag's translucency blurs the details of the onion. Beautiful. Thanks for coming by, Jeff. I appreciate your thoughts.